RTP is one of the most prominent high-tech research and development parks in the United States. It was created in 1959  by state and local governments, nearby universities, and local business interests. Karl Robbins bought the land where the park is now built. The park covers 7,000 acres (2,833 ha) situated in a pine forest with 22,500,000 square feet (2,090,318 m2) of built space. The park is traversed by Interstate 40; the Durham Freeway; and NC 540. The park hosts one of GlaxoSmithKline's largest R&D centers with approximately 5,000 employees. Cisco Systems' campus in RTP, with approximately 5,000 employees, is the second highest concentration of its employees outside of its Silicon Valley corporate headquarters. The National Institute of Health has its National Institute of Environmental Health Sciences located in RTP and Durham. Research Triangle Park is owned and managed by the Research Triangle Foundation,  a private non-profit organization. In August 2017, Scott Levitan was named the organization's new President and CEO, making him the 9th leader since the foundation was established. Established in 1951 and located in North Carolina, Research Triangle Park was created to increase innovation in the area. It is near Duke University, North Carolina State University, and the University of North Carolina at Chapel Hill. At first, the park struggled to recruit innovators, but in 1965, Research Triangle Park had its largest surge of growth, thanks to heavy recruiting by the state's government and Archibald (Archie) Davis. In their article "The Growth of Research Triangle Park," Link and Scott posit that entrepreneurial culture and, especially, leadership contributed the most to its success as a cluster. Archie Davis promoted a culture of innovation and entrepreneurship by locating the park near universities, actively recruiting organizations (like the American Academy of Arts and Sciences), and used his vision to raise funding for the park. See also: Category:Universities and colleges in the Research Triangle. 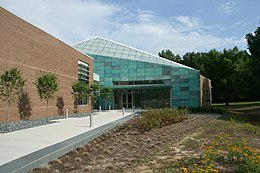 Wikimedia Commons has media related to Research Triangle Park. ^ a b "The Research Triangle Park". Rtp.org. Retrieved 2013-05-16. ^ "Minneapolis to host annual conference of university research parks". MedCity News. 2010-08-09. Retrieved 2013-05-16. ^ "Research Parks and Job Creation: Innovation Through Cooperation". .nationalacademies.org. 2009-12-09. Retrieved 2013-05-16. ^ "Research Triangle Park" (PDF). ^ Bracken, David (2010-09-04). "RTP begins updating its master plan". NewsObserver.com. Archived from the original on 2010-10-12. Retrieved 2018-11-02. ^ "RTP: Research Triangle Primer". Forbes. 2012-04-18. Retrieved 2013-05-16. ^ WRAL Tech Wire (2011-02-16). "GSK cutting positions in RTP, nationwide -TechWire Insider :: Editor's Blog at WRAL Tech Wire". Wraltechwire.com. Retrieved 2013-05-16. ^ "Cisco to slash 6,500 workers; RTP impact unknown". WRAL.com. 2011-07-18. Retrieved 2013-05-16. ^ Chodavadia, Parth (2012-11-28). "Research Triangle Park develops strategy for future growth". Duke Chronicle. Retrieved 2013-05-16. ^ a b "The Man and Plan Behind Research Triangle Park – Our State Magazine". Our State Magazine. 2014-08-25. Retrieved 2017-12-06. ^ Link, Albert N.; Scott, John T. (2003). "The Growth of Research Triangle Park". Small Business Economics. 20 (2): 167–175. doi: 10.2307/40229257. JSTOR 40229257. ^ "Self-Driving Tour of Research Triangle Park" (PDF). Archived from the original (PDF) on 2012-04-01. ^ "The Research Triangle Park Jogging & Pedestrian Trails" (PDF). ^ a b Choose RTP Park Life About RTP Contact Us Blog (2012-07-31). "Master Plan Update: Legislative Changes Approved". The RTP Blog. Archived from the original on 2012-08-19. Retrieved 2013-05-16. ^ Choose RTP Park Life About RTP Contact Us Blog (2012-10-03). "Master Plan Update: Zoning Gives Room to Grow". The RTP Blog. Archived from the original on 2013-04-15. Retrieved 2013-05-16. ^ Bracken, David (2012-07-16). "New RTP master plan to be unveiled this fall | Local/State". NewsObserver.com. Archived from the original on 2013-05-02. Retrieved 2013-05-16. ^ "RTP Reveals Park Center Plan - The Research Triangle Park". The Research Triangle Park. Retrieved 2016-01-29. ^ "Park Center Redevelopment". The Research Triangle Park. Retrieved 2016-01-29. ^ "RTP Announces $50M for Park Center Development". Vimeo. Retrieved 2016-01-29. ^ "The Frontier". The Research Triangle Park. Retrieved 2016-05-03. ^ "The Lab - The Research Triangle Park". The Research Triangle Park. Retrieved 2016-05-03. ^ "About The AKD Conference Center - The Research Triangle Park". The Research Triangle Park. Retrieved 2016-05-03. Link, Albert N. (1995). A Generosity of Spirit: The Early History of the Research Triangle Park. Research Triangle Park: Research Triangle Foundation of North Carolina. ISBN 978-0-9648051-0-1. OCLC 33045964. Link, Albert N. (2002). From Seed to Harvest: The Growth of the Research Triangle Park. Research Triangle Park: Research Triangle Foundation of North Carolina. ISBN 978-0-9648051-1-8. OCLC 50694901.